I wish that meant something super special, but it doesn't. No special dates on the calendar- not counting down to anything. I have been "watching" everyone begin to get their rooms ready for the year! I even had to run up to my "old school" (that sounds weird) today to pick something up and there was a parking lot full of teachers who could not wait to get into their rooms and start getting them ready for the new school year. We start here on the 6th of August- so that is right around the corner! It sort-of -(I stress sort of) kinda -almost -in -a- way made me sad that I do not have a room to prepare decorate this year. As stressful as that part is, I think it is one of my favorites! Not always the fave of The Mr. though because sometimes it involved ALL NEW decorating- like new colors, more fabric, new containers..... I actually got put on "fabric restriction" once. I thought that if I couldn't share new ideas, that I might be able to share a few things that have worked for me in the past- and maybe, just maybe, it might be something that will help you out while you are trying to get your room ready for the year. There was never really a place that I could make a my word wall home when I was in my first room (nine years ago) I had a huge blank wall, but I didn't want to have to fool with tape or Velcro. 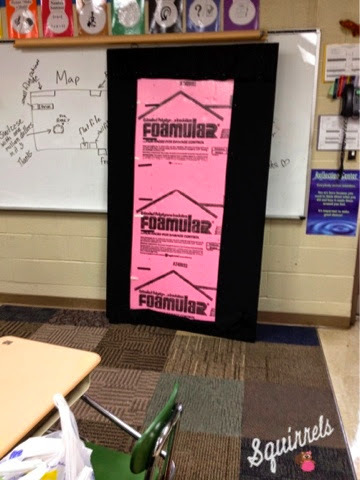 So instead, I purchased a sheet of foam insulation. And I covered it with (what now looks like Day Glow) green fabric. I used my staple gun to get the fabric on, and then I used a little hot glue on the back. Now, had it been free "hanging"' it would never have stayed on the wall with just the hot glue- but there was a counter top right below that held most of the weight. So the hot glue was just sort of tacking it into place. When I moved to my new room, there was an air conditioner right below that space that I wanted my Word Wall to live. Instead of hot glue this time though, I used six command strips. Yep, just six. When words moved from the easel to the board, I just used my stapler. And they stayed. The board even moved with me when I made my move to fourth. I just added a few more strips! Super easy to do! 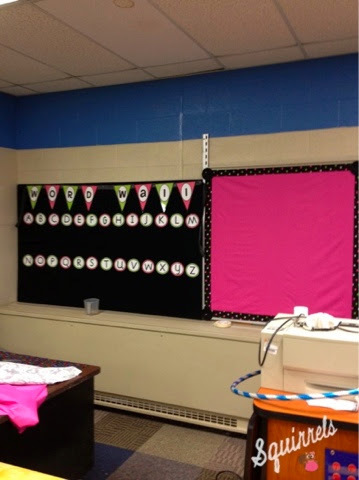 And it doesn't necessarily have to be a word wall, it could be any type of bulletin board. The main thing for me was the fact that it stayed in place and all the cards that I put on it did, too! Check back over the next week to see other projects that might help you out! I made a bulletin board like that years ago! I was in a room with cinder blocks so my options for hanging things were pretty limited. I haven't used it in a couple years but it's still hanging out in my garage. But an easy fix- that puppy held up for 9 years!!! I have a black chalkboard in my new classroom that I'm not sure how I'll use. I really like the idea of gluing a foam core board over it and turning it into a bulletin board. Thanks for the idea!